The sudden and untimely demise of Sanjeev K. Aggarwal on Saturday afternoon, Director of BITS Pilani (Goa), was deeply mourned by students, faculties, and staff of both BITS Pilani and IITs. Sanjeev K. Aggarwal who was appointed as the Director of BITS Pilani (Goa) on 13th August, 2013 felt uneasy during a departmental meeting and was immediately rushed to SMRC Hospital where he was declared dead at 1.00 pm. Professor Aggarwal was admired by his students, staff, and faculty for his calm and polite demeanor and intelligence. 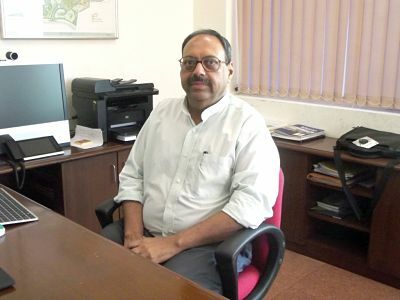 He was a reputed professor of computer science who joined BITS Pilani (Goa) after a successful tenure of 25 years at IIT-Kanpur from where he earned his Ph.D and M.Tech. He was especially recognized for his extensive research in Compiler Design. He was involved in handling various industry and government funded projects. He had also published a large number of papers in international forums. From 1986 to 1990, Professor Aggarwal worked with Tata Research Development and Design Center in Pune. He had special fondness for teaching courses in Compiler Design, Advanced Compiler Design, Compilers for Multicore Architectures, Programming languages and Software Engineering. Professor’s Funeral procession will leave at 10.00 am Monday (13th January). A condolence meeting will also be held on the same day at 5.00 pm at the Auditorium. During his tenure at BITS Pilani as the Director, Professor Sanjeev K. Aggarwal had won the hearts of everyone with his full-fledged administration, critical acumen, and innovative ideas. He will always be remembered for his remarkable achievement and intelligence. We pray to the God for his soul to rest in peace and to give his family enough courage to bear this irreparable loss. « Biggest Misconceptions Indians have about India!